Whitbread PLC ("Whitbread" or the "Group") is pleased to announce that it has entered into an agreement for the sale of Costa Limited ("Costa"), one of the world's leading coffee brands, to The Coca-Cola Company ("Coca-Cola"), for an enterprise value of £3.9 billion (the "Transaction"). "I am delighted that we have agreed the sale of Costa to Coca-Cola for £3.9 billion. This transaction is great news for shareholders as it recognises the strategic value we have developed in the Costa brand and its international growth potential and accelerates the realisation of value for shareholders in cash. The announcement today represents a substantial premium to the value that would have been created through the demerger of the business and we expect to return a significant majority of net proceeds to shareholders. Whitbread will also reduce debt and make a contribution to its pension fund, which will provide additional headroom for the expansion of Premier Inn. The sale of Costa to Coca-Cola is another successful landmark in the 276-year history of Whitbread. Whitbread acquired Costa in 1995, for £19 million when it had only 39 shops and successfully grew the business to be the UK's favourite and largest coffee shop company. In more recent years, we have been focused on building Costa into a leading multi-channel, international coffee brand. This has resulted in this unique strategic opportunity to combine the Costa brand with Coca-Cola's global scale, product and distribution capabilities. This combination will ensure new product development, continued growth in the UK and more rapid expansion overseas. As a result of this strategic sale our teams, pensioners, suppliers, shareholders and other stakeholders will all have the opportunity to share in the benefits. Premier Inn, the UK's leading hotel business, will continue to develop its highly successful and unique business model, with even greater focus and financial investment. Premier Inn will continue to take advantage of the considerable structural growth opportunities in the UK and accelerate its network expansion in Germany. This will deliver strong return on capital and significant value to shareholders over the long term." "Costa gives Coca-Cola new capabilities and expertise in coffee, and our system can create opportunities to grow the Costa brand worldwide. Hot beverages is one of the few remaining segments of the total beverage landscape where Coca-Cola does not have a global brand. Costa gives us access to this market through a strong coffee platform. I'd like to welcome the team to Coca-Cola and look forward to working with them." Costa is a leading international coffee brand and the UK's favourite coffee shop, with over 2,400 coffee shops in the UK and over 1,400 stores in more than 30 international markets. Costa also operates the fast-growing self-serve business, Costa Express, with over 8,000 Costa Express self-serve machines in eight countries. Costa also operates an in-home distribution and wholesale coffee business with high potential. Whitbread acquired Costa in 1995 when it owned 39 stores and has grown the business into the successful business it is today. 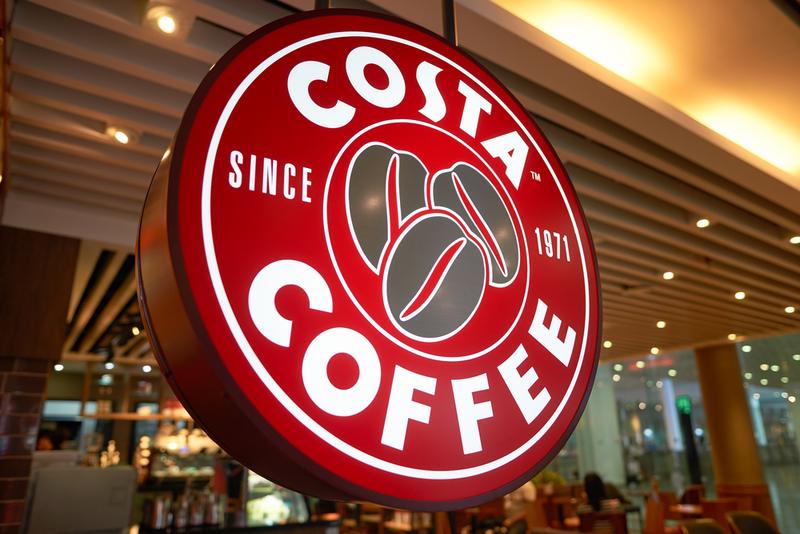 As at 1 March 2018, the gross assets of Costa were £547 million. Further financial information will be set out in the circular. The Coca-Cola Company (NYSE: KO) is a total beverage company, offering over 500 brands in more than 200 countries and territories. In the year ended December 2017, Coca-Cola generated revenue of $35.4 billion and operating income of $9.7 billion. Coca-Cola is listed on the New York Stock Exchange, with a market capitalisation of approximately $195 billion. In addition to the company's Coca-Cola brands, the portfolio includes some of the world's most valuable beverage brands, such as AdeS soy-based beverages, Ayataka green tea, Dasani waters, Del Valle juices and nectars, Fanta, Georgia coffee, Gold Peak teas and coffees, Honest Tea, innocent smoothies and juices, Minute Maid juices, Powerade sports drinks, Simply juices, smartwater, Sprite, vitaminwater and ZICO coconut water. Together with its bottling partners, Coca-Cola employs more than 700,000 people, helping bring economic opportunity to local communities worldwide. Following completion of the Transaction, Whitbread will be a focused hotel business with over 75,000 rooms in almost 800 hotels in the UK, Germany and the Middle East, operating under the Premier Inn brand. Whitbread will also retain its 49% investment in Pure, a London-based healthy-eating quick service restaurant business with 15 stores. · enhancing the capabilities of Whitbread to support long-term growth. In the UK, Premier Inn has a unique business model and position in the hotel market, supported by a significant food and beverage offering. Through a significant degree of freehold property ownership and an owner-manager approach, Premier Inn ensures a high degree of consistency throughout its hotel estate with high quality and good value for money. This ensures hotel guests have a strong preference for Premier Inn, which provides an industry leading proportion of direct bookings that has recently increased to over 95% for the year ending 1 March 2018. Premier Inn's unique business model provides a strong opportunity to grow market share versus the structurally disadvantaged independent segment. The independent segment currently holds more than 50% market share, but this has been declining by approximately one percentage point per annum. Through building new hotels, extending existing hotels, and further enhancing the operating model, Premier Inn expects to continue to win market share, increasing its position from approximately 9% in 2016 to over 12% beyond 2020. Premier Inn has a strong track record of maintaining occupancy at approximately 80%, at the same time as increasing room capacity by 25% over the last three years. · given the regional dispersal of industrial development, there is a high degree of business travel. Premier Inn's unique business model of high quality, consistency and value for money resonates well with domestic German travellers, having been successfully trialled in Premier Inn's first hotel in Germany, which was opened in Frankfurt in 2016. Premier Inn's attractive opportunities to continue growing in the UK and the increased focus on network expansion in Germany, provide Whitbread with confidence that the committed pipeline for new capacity at 1 March 2018 of more than 20,000 rooms will be opened successfully and deliver a compelling return on capital. Whitbread expects to update shareholders on its strategic progress and future plans at a capital markets day to be held in early in 2019.